Excellent Workmanship;Made Of Quality Material,Strong and Sturdy. Value Bracelets Set;Resonable Price,Go Well With Any Outfit,Worthy Buy It. Adjustable Length,Easy To Wear;Perfectly Fit All Of The People. Beautiful Apperence,Good Ideal Send to Friends,Family at Christmas, Halloween,Birthday,Anniversary Etc. 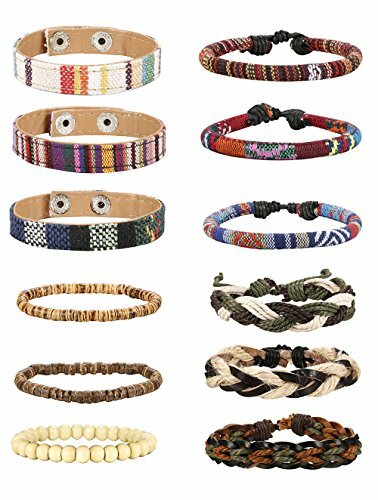 AFFORDABLE PRICE--There Are 6/12 Pcs Bracelets a Set;Hemp Cords Bracelets,Wood Beads Bracelets,Linen Bracelets,Different Styles and Variety Colors,Economical Jewelry Bracelet Set for Both Men and Women,Boys and Girls. ADJUSTABLE SIZES--Using Adjustable Buckle and Knot,7-9.5 Inch Length,Suitable for Most People,Never worry About It Will Bigger Or Small for You,Easy to Put Them On or Take Off. 4-LEVEL QUALITY CONTROL--100% Hand-Made;Quality Hemp Cords,Braided Bracelets and Wooden Beads Bracelet;100% Quality Inspection;Durable and Solid,Keeping Longer Time to Use. ASSORTED STYLE--Come With Different Cuff Bracelet In Trendy Style.You Can Wear It Together Or Separately,Or You Can Pair With Any of Your Other Wrap Bracelet,Go Well With Your Any Outfit,Show Your Personality Every Moment. AFTER-SALE SERVICE--90-Day Money Back Guarantee or Exchange;We Are Engaged in Providing Better Shopping Experience.